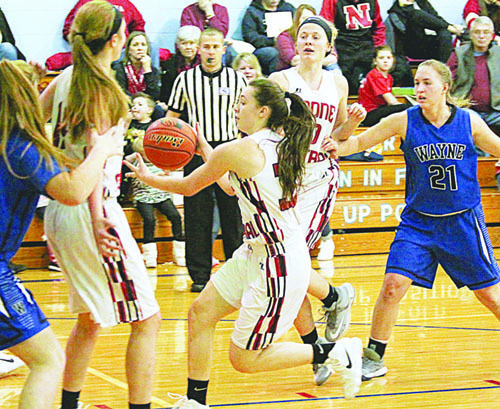 With a schedule of top-notch competition continuing, the young Boone Central/Newman Grove Lady Cardinals took some lumps in the first week of January. Boone Central/Newman Grove (2-9) began a hectic week by traveling to Kearney Tuesday, Jan. 2, and lost a 57-33 decision to an impressive Kearney Catholic (8-3) team. The Cardinals trailed 6-5 when Catholic used a 9-2 run to open a 15-7 advantage. From there, the Stars forged a 30-18 halftime lead, then began the second half with a 9-0 blitz. “We allowed Kearney Catholic’s press to dictate tempo. A lack of offensive execution and turnovers slowed our offensive production,” said Card Coach Andy Imus. “We had a few defensive breakdowns, continue to give up too many offensive rebounds, and need to develop toughness. Boone Central/Newman Grove returned to the road Friday and dropped a competitive 51-42 contest to the O’Neill Eagles (6-5). The Cardinals fought the hosts evenly in a 19-19 first half, and again in the fourth quarter (18-18). O’Neill’s winning advantage came from a dominant third quarter where the Eagles used defensive pressure to spark a 14-5 run. Boone Central/Newman Grove completed its week with a nominal home game Saturday at Newman Grove. The Cardinals found no easy task, however, as Wayne (10-4) continued a strong season with a 62-39 victory. Shooting 40 percent overall – and 43 percent from 3-point range – the Blue Devils raced to a 21-13 lead and never looked back. Ashton Boyer’s two 3-point field goals sparked the early run and Sarah Greenwald hit a pair of long range bombs in the second quarter to help Wayne take a 37-24 halftime lead. “We did a fairly good job on the defensive side. Wayne shot extremely well and executed well,” Imus commented. “Offensively we need to continue to get more consistent execution. We allowed Wayne’s full court man defense to dictate the tempo.